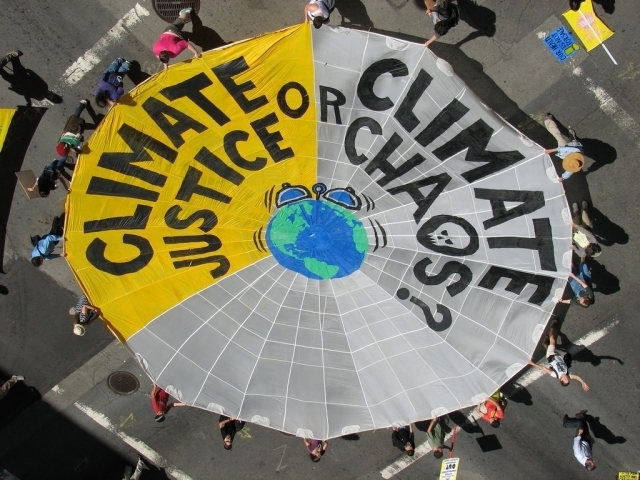 The term climate justice has come into widespread use in the climate movement in the past 5 years. As the movement has grown and expanded, it has reached out to parallel movements seeking to address injustice, including labor, Black Lives Matter, and Indigenous rights. Climate justice has come to be the overarching term used to define a “movement of movements” based on the understanding that our unjust political and economic system creates societal inequities AND climate change. Without a focus on correcting injustice, work on climate change addresses only symptoms, and not root causes. Climate justice is a rights-based framework: It advocates not just for individual liberties, but for collective rights of groups such as Indigenous peoples and people of color. Justice is central: In this context, justice means that communities who have suffered at the expense of destructive economies must not suffer in order for carbon reductions to occur. Justice is not a moral obligation alone, but also a pragmatic pathway forward. Climate justice says “no” to the Trojan horse of the climate “emergency mode”: Climate justice is underpinned by a long-view approach to social transformation. While there is no denying that climate change is an urgent crisis, that urgency must not be used as an excuse to ignore justice concerns and make unprincipled compromises that harm the most marginalized communities. The ethical argument for orienting our work on climate change around climate justice entails the understanding that climate change is a physical manifestation of an unjust political-economic system. The pragmatic argument is that climate justice is a mandate to work in solidarity with local and global communities that are being hit “first and worst” by climate change. These communities have contributed least to the greenhouse gas emissions that cause climate change. Meanwhile, they are the same communities that are historically and currently hit “first and worst” by gross inequities in our systems of governance. The success of efforts to combat climate change depends on a climate justice approach – on work in alliance with and support of those on the front lines of economic, social, and racial injustice who are also, therefore, on the front lines of climate change. A collective decision was made after the September 2014 People’s Climate March to change our name from Riverdale-Kingsbridge Coalition for Climate Action (a name adopted as people in the Riverdale/Kingsbridge/Marble Hill area mobilized for the March), to Bronx Climate Justice North. The name change was made with the conscious intent that our work be grounded in climate justice, both ethically and pragmatically. The new name also reflected our broad geographic base, since our members come from neighborhoods throughout the borough. The name change was proposed by Bronx Climate Justice, a coalition of environmental justice and climate justice organizations in the South Bronx with whom BCJN is in formal and active alliance. BCJN subscribes to the Jemez Principles for Democratic Organizing written by the Southwest Network for Environmental and Economic Justice (SNEEJ) in Jemez, New Mexico, in December 1996. 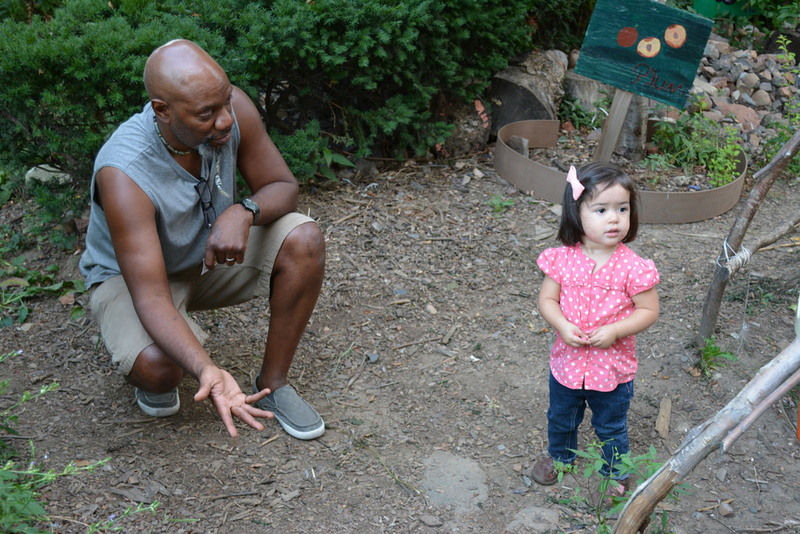 South Bronx Unite founding member Mychal Johnson with a friend at Brook Park Community Garden in the S. Bronx during a September 3, 2014 Bronx Climate Justice organizing meeting for the People’s Climate March. Photo: Maryam Adrangi. A Climate of Change: African American, Global Warming, and a Just Climate Policy for the U.S.